2005, softcover, 102 pp., illustrated. The author of Saltwater Farm and Beside the Saint George‘s recalls her days as one of Uncle Sam’s favorite nieces, working in Washington, DC during the early days of the Second World War. “In the 1840s, girls from New England farms flocked to Lowell, Massachusetts to work in the textile mills. They operated dangerous, noisy machines, worked long hours for little pay, lived in crowded boarding houses, and profoundly changed how American women perceived themselves. 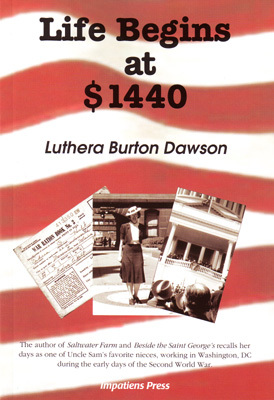 One hundred years later Luthera Burton Dawson, great niece of a Lowell mill girl, joined the stream of young women headed to Washington D.C. to government jobs as typists and stenographers. The salary of $1,440 per year, earned by these young women after their first promotion, was a powerful incentive in those Depression years.